Perhaps no term better describes the state of mankind across the globe right now than this one. In many nations this description is practically a one-way guaranteed ticket to poverty, homelessness and starvation. In others, multiple studies show it often sets those left alone or left behind on a path toward lesser and yet still frighteningly negative, threatened results: food insecurity, dropping out of school, incarceration. Of course these results are not inevitable, but the downward pull of the current of culture on a child left with only one parent is a powerful one. Here’s the sometimes difficult-to-swallow truth: women and children need strong, faithful men involved in their lives to experience all God wants for them. (We needn’t get up in arms about such an assertion, as God Himself already made it clear way back in the beginning that men don’t do well without women, so we don’t even need to go over that. As Rita Rudner once said, “Men don’t live well by themselves. They don’t even live like people. They live like bears with furniture.”) God designed families with a mother and father for a reason: We need each other. What can we learn about what families need from dads, from the example God the Father sets for us? What does God as a Father do that we can take notes from? *A father provides for his child. Your child needs you to provide for them gladly. *A father affirms his child. Your child needs to hear that you are well pleased with him. *A father disciplines his child. Your child needs to know you care enough to take time to correct her. *A father directs his child. Your child needs the benefit of your age and wisdom as he makes decisions. *A father sacrifices for his child. Your child needs to see you sometimes giving something important up for her sake. Ultimately, we see the clearest representation of God the Father in Jesus, Himself. Studying Jesus’ interaction with His disciples—touching them (washing feet! 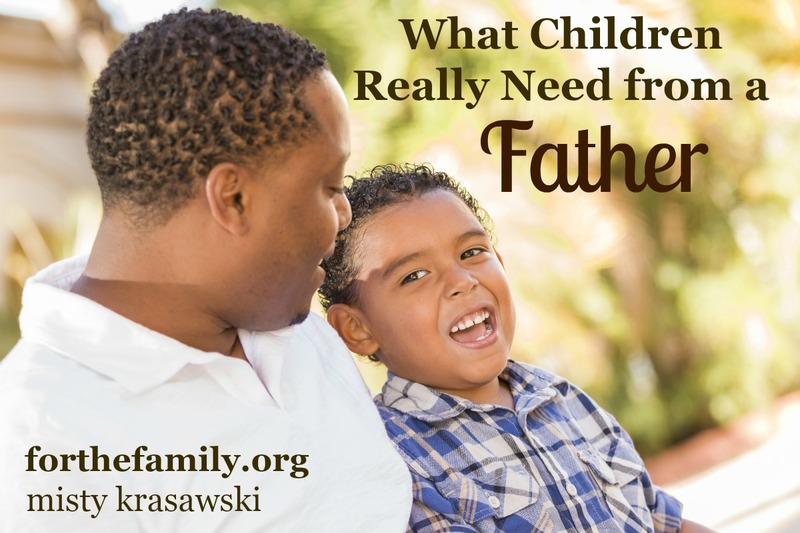 ), counseling them, affirming them, feeding them, healing them, teaching them, and ultimately giving His life for them—is the most perfect example of what fatherhood should look like. And just in case you or your children are without a father today? Know this: Jesus came to show that you’re actually not. Today, I pray you know the perfect love of the perfect Father. And if you’re a dad, I pray you reflect that kind of fatherhood to your children. Only one thing missing: A Father should LOVE the mother – showing the child, firsthand, love…..